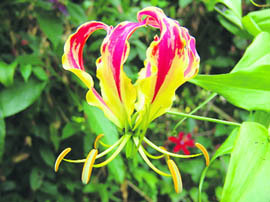 Gloriosa (Family Liliaceae) or glory lily is a highly ornamental, tuberous rooted climber which climbs up with the help of its tendrils at the ends of its slender leaves. It bears 3-4’’ flowers in warmer climates between June and September. As houseplants, gloriosas need at least four hours of sunlight a day. However, it does best in full sun or very light shade and soil enriched with well-rotted farmyard manure. While planting, lay the tubers on the side 8-12 inches apart and cover with 4-5 inches of soil. Light support, where there is no natural support, is recommended for keeping the plants tidy and enjoying the beauty of their flowers.